Dave Matthews Band, also known by the initialism DMB, is an American rock band that was formed in Charlottesville, Virginia in 1991. 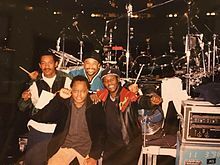 The founding members were singer-songwriter and guitarist Dave Matthews, bassist Stefan Lessard, drummer and backing vocalist Carter Beauford, and saxophonist LeRoi Moore. Boyd Tinsley joined the band as a violinist soon after. In August 2008, LeRoi Moore died due to complications from injuries sustained in an ATV accident. Soon after, Grammy Award winner Jeff Coffin (of Béla Fleck and the Flecktones) joined and since filled Moore's spot as saxophonist. In May 2018, a lawsuit alleging sexual misconduct was filed against Tinsley by a former bandmate in his side project, an accusation that Tinsley denies. As a consequence, Tinsley was officially fired from the band. Trumpeter Rashawn Ross, guitarist Tim Reynolds, and keyboardist Buddy Strong also have become full-time members of the band. Other former members include keyboardists Peter Griesar and Butch Taylor. The group's most recent album, 2018's Come Tomorrow, debuted at number one on the Billboard 200 chart, making Dave Matthews Band the first group to have seven consecutive studio albums debut at the peak. As of 2018[update], the Dave Matthews Band has sold more than 100 million tickets since its inception and a collective 91 million CDs and DVDs combined. In August 2004, DMB was at the center of a controversy when about 800 pounds of liquid human waste was dumped from band member Boyd Tinsley's tour bus through the grate in the Kinzie Street Bridge in Chicago onto passengers aboard a sightseeing boat on the Chicago River below. The band is known for playing songs differently each time they're performed live. This has become a staple of DMB's live shows since the early 1990s. Another staple of their annual summer tours is a three-day stint at The Gorge Amphitheatre in Washington state over Labor Day weekend. Their limited instrumentals, however, did not provide the full sound they desired; more musicians were needed. John D'earth, conductor of the University of Virginia orchestra and a local musician, taught music at the Tandem Friends School and had previously played alongside Moore and Beauford in the jazz fusion band "Secrets". Stefan Lessard, a junior bassist at the time, was under his guidance in a student jazz combo known as "Yabanci Jazzites". On the recommendation of John D'earth, the 15-year-old Lessard was asked to join in the studio to help complete the demo. While the partnership was never intended to continue beyond the studio, the four liked the sound and decided to continue together for live performances as well. Consequently, regular practices began in the basement of Carter Beauford's and Matthews' mother's home. Boyd Tinsley was the last member to join the band. Although he had performed on the demo with Matthews, Moore, Beauford and Lessard, he was busy with a couple of other bands at the time (Boyd Tinsley Band and Down Boy Down) and did not want to commit to the group at first. He did not become a full-time member until 2004. Tinsley is well known for his violin solos, which often become one-on-one duels with Dave during live shows. Matthews later admitted, "We had no plans of adding a violinist. We just wanted some fiddle tracked on this one song "Tripping Billies", and Boyd was a friend of Leroi. He came in and it just clicked. That completely solidified the band, gave it a lot more power." 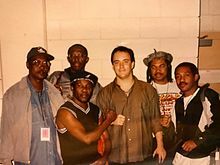 Members from Toots & the Maytals and Dave Matthews Band when performing together in 1998. 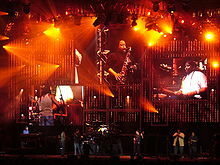 Paul Douglas (left), Carter Beauford (back), LeRoi Moore (front), Toots Hibbert (right). On September 20, 1994, DMB released their debut studio album, Under the Table and Dreaming, featuring their first commercial hits "What Would You Say" (featuring John Popper of Blues Traveler fame on harmonica), "Satellite", and "Ants Marching". The album was dedicated "In memory of Anne" for Matthews' older sister Anne, who was killed by her husband in 1994 in a murder–suicide. Under the Table and Dreaming and its follow-up album, Crash brought the band national attention, culminating in 3 Grammy Awards. Grammy Award for Best Rock Performance by a Duo or Group: "So Much to Say", Grammy Award for Best Rock Song: "Too Much" and Grammy Award for Best Rock Album: Crash. The band also achieved hits with "Crash into Me", "Too Much", and "Tripping Billies". In late 1997, the band returned to the studio with producer Steve Lillywhite and an array of guest collaborators, including Reynolds, banjoist Béla Fleck, vocalist Alanis Morissette, future touring band member Butch Taylor, Chapman Stick player Greg Howard,and the Kronos Quartet. They composed and recorded Before These Crowded Streets, their third album with RCA, which was released on April 28, 1998. The album represented a great change in direction for the band as they did not rely on upbeat hit singles to carry the album. "Stay (Wasting Time)", an uplifting gospel number, and "Crush", a love ballad, became very popular tracks along with the lead single, "Don't Drink the Water". Dave Matthews has commented that the inspiration for this song came from the treatment of Native Americans by the United States government. Before These Crowded Streets was an instant commercial success with over 900,000 albums sold worldwide in the first week. As of 2018, there has been over 21,000,000 copies sold worldwide. During the summer, the band took part in the Woodstock '99 concert and then released their third live album, Listener Supported, in the fall. The album, a live recording, used a show performed at the Continental Airlines Arena in East Rutherford, New Jersey on September 11, 1999 for a PBS television special. The album was also released as the band's first DVD. The year also provided two more Grammy wins. From their recent album, they earned another Grammy Award for Best Rock Album: "Before These Crowded Streets" and a Grammy Award for Best Pop Collaboration with Vocals: "Crush". In October 2000, an energized Matthews began writing with Glen Ballard, most famous for his work with Alanis Morissette. The rest of DMB (along with special guest Carlos Santana) soon joined Matthews in a Los Angeles studio and quickly recorded Everyday. While the album gave the band a fresh start, Ballard's production, which featured a pop-rock music sound and no songs over 4:43, was very different from the acoustic sound and long jams that the albums produced by Steve Lillywhite featured (only 8 of the 35 tracks on the previous three albums were under 4:43). Carter Beauford has said that the album was a product of Matthews and Ballard, and that it did not showcase the rest of the band. The February 27, 2001, release of Everyday was a huge commercial success. The singles "I Did It", "Everyday", and "The Space Between" all charted on many of Billboard's charts, including Hot 100 and Top 40. In March 2001, the Lillywhite studio sessions from the previous year were leaked over the Internet. The tracks spread quickly over established Internet channels such as Napster. Collectively known as The Lillywhite Sessions, these tracks were lauded by both the fan base and the popular press. After critical comparison of the two simultaneous albums, fans that were less than pleased with Everyday's more electric sound were frustrated with the band's decision to scrap the work in exchange for Everyday. 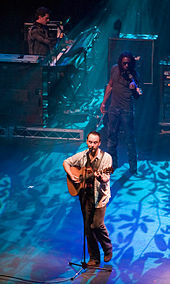 Dave Matthews Band performing "Last Stop" at The Pavilion on July 5, 2006. Dave Matthews Band performing at Vodafone Arena in Melbourne on May 1, 2007, starting their second tour of Australia. According to Billboard magazine, the band's new studio album had been scheduled to be released in July by RCA Records, but in an interview with the Brisbane Times on May 4, 2007, Stefan Lessard stated, "We're on a bit of a creative break as far as working in the studio – we've been in pre-production for a long time, but we'll get more serious later in the year." On September 6, 2007, Dave Matthews Band performed a free concert for the Virginia Tech student body and faculty. The show was entitled "A Concert for Virginia Tech" and was done in memory of the shootings that took place on April 16, 2007. John Mayer, Phil Vassar, and Nas joined them. There were over 50,000 people in attendance. Two days later, they performed a benefit show at Atlanta's Piedmont Park with the Allman Brothers Band opening. Though only 75,000 tickets were sold (50,000 originally, then a second block of 15,000) nearly 20,000 people sneaked into the show, making it the largest one-day concert in Atlanta history. The show raised money for the Piedmont Park Conservancy Association. It was released as a CD/DVD called Live at Piedmont Park. The album was nominated for two 2010 Grammy Awards: Best Rock Album and Album of the Year. It lost to Green Day's 21st Century Breakdown and Taylor Swift's Fearless, respectively. During the awards telecast, the band played "You and Me" with accompaniment by live singers, percussionists, a string section, and an eight-piece horn section made up of teenagers from the Grammy Jazz Ensemble. In January 2014, the 2014 Summer Tour was announced as "A Very Special Evening With Dave Matthews Band", where the band played two sets at each show, one being acoustic and featuring different onstage lineups, and the traditional DMB electric set, with no opening acts. This also marked the first time that DMB did not make their annual two-night run at Alpine Valley Music Theatre since 2001. On January 16, 2018, Dave Matthews Band announced a summer 2018 tour along with their ninth studio LP. The title of the album was announced, Come Tomorrow, as well as the release date of June 8, 2018. In February 2018, Boyd Tinsley took a leave of absence from the band to focus on his health. On May 18, 2018, the band announced that Tinsley had been fired from the band in response to a lawsuit filed by former Crystal Garden band member James Frost-Winn alleging sexual misconduct by Tinsley. In its first week of release, Come Tomorrow debuted at number one on the US Billboard 200 with 292,000 album-equivalent units, making it the biggest sales week for a rock album in over four years, and the biggest sales week for an album in 2018, with 1,185,000 copies sold as of December 2018. It was their best selling album since Big Whiskey and The Gru Grux King, which had 4,300,000 sales. It is also their seventh consecutive album to achieve the #1 spot on the Billboard 200. On September 25, 2018, Dave Matthews Band announced a fall/winter twelve date arena tour following their successful 2018 Summer Tour. It started at Schottenstein Center in Columbus, Ohio, and went to major eastern U.S and Canadian cities. The fall/winter tour concluded at John Paul Jones Arena in their hometown of Charlottesville, Virginia. In the 2000s, it was common to see several sources per show, sometimes as many as five or more. According to the band's website, as of May 2010[update], the band's own charity, the BAMA Works Fund, has contributed over $8.5 million to a wide variety of need organizations. It was founded in 1999 to address the needs of disadvantaged youth, disabled persons, the environment, and arts and humanities in the city of Charlottesville, Virginia area, and surrounding area of Albemarle, Buckingham, Fluvanna, Greene, Louisa, Nelson, and Orange Counties. In addition, BAMA Works Fund has been active in other projects, and often the Dave Matthews Band, both as a whole and individually, have planned charity events and donated their time and resources outside of Charlottesville. Some examples include building a "Village Recovery Fund" after the tsunami that ravaged Sri Lanka, promoting a challenge grant for the Habitat for Humanity Musician's Village in New Orleans, multiple appearances to benefit both Farm Aid and the annual Neil Young-sponsored Bridge School Benefits, fundraisers for the victims of Hurricane Katrina, and followed this with donations after the 2010 disaster that leveled many villages in Haiti. The band played benefit concerts to help fund the school system in New York City, and countless other concerns. As a result, the band was awarded the NAACP Chairman's Award. In Matthews' acceptance speech, he spoke for the band as a whole, commenting that of all the achievements they had enjoyed, that the award by the NAACP and Julian Bond in particular was by far the highest honor they had bestowed upon them. ^ "Members Tim Reynolds". Retrieved December 3, 2012. ^ "Members Rashawn Ross". Retrieved December 3, 2012. ^ "Members Jeff Coffin". Retrieved December 3, 2012. ^ "Jeff Coffin Mu'tet with Felix Pastorius, Futureman, Kofi Burbridge and more: Mutopia". Abstract Logix. Mutopia. Archived from the original on June 15, 2009. Retrieved May 3, 2009. ^ Young, Alex (May 17, 2018). "Boyd Tinsley fired from Dave Matthews Band". Consequence of Sound. ^ Aswad, Jem (May 18, 2018). "Boyd Tinsley, Accused of Sexual Harassment, Is 'No Longer a Member' of Dave Matthews Band". Variety. Retrieved May 21, 2018. ^ Leight, Elias (May 18, 2018). "Boyd Tinsley: 'I Will Defend Myself Against False Accusations' of Sexual Misconduct". Rolling Stone. Retrieved May 21, 2018. ^ "Dave Matthews Band Scores Seventh No. 1 Album on Billboard 200 Chart With 'Come Tomorrow'". Billboard. Retrieved June 18, 2018. ^ Speer, Deborah (January 16, 2018). "Dave Matthews Band Brings Back The Jams in 2018". www.pollstar.com/. ^ Harris, Chris (March 1, 2005). "Surprise, Surprise: Dave Matthews Band Hitting The Road This Summer". MTV. Retrieved October 11, 2008. For jam-band aficionados, no summer would feel complete without the Dave Matthews Band rolling through town for an evening of music spent under a star-soaked sky. That's because the DMB have consistently toured, summer after summer, since 1998 — and yes, this summer will be no different. ^ "Dave Matthews Band Is Coming To Pennsylvania". Retrieved February 7, 2014. ^ "Boyd Tinsley Biography". Retrieved April 15, 2009. ^ @slessard Twitter September 10, 2010 (6) tweets, October 10, 2010 (1) tweet, November 10, 2010 (1) tweet. Additional comments include recording the show on a Tascam 8-track tape and that Stefan was then sixteen years old. ^ "Dumela Definition". Archived from the original on February 2, 2008. Retrieved April 15, 2009. ^ "Dave Matthews Band History". Archived from the original on April 15, 2009. Retrieved April 15, 2009. ^ Waldo, Jaquith (2000). "Interview with Peter Griesar". nancies.org. Retrieved July 18, 2006. ^ "Dave Matthews Band Albums". Retrieved April 15, 2009. ^ "Remember Two Things". Archived from the original on May 19, 2009. Retrieved April 15, 2009. ^ "Nelly Hits New Heights In July RIAA Certifications". Billboard. August 6, 2002. Archived from the original on December 27, 2007. Retrieved June 15, 2009. ^ "The Dave Matthews Band Taping Policy and AM.org's Policy – Antsmarching.org Forums". Antsmarching.org. October 19, 2002. Retrieved April 19, 2014. ^ "Dave Matthews Band Chart History". www.billboard.com. ^ "DMBAlmanac entry for Everyday". Retrieved April 17, 2012. ^ "DMBAlmanac entry for 12.19.98". Retrieved July 12, 2009. ^ "DMBAlmanac entry for 7.11.01". Retrieved July 12, 2009. ^ "Dave Matthews Band Blamed For Human Waste". CBStoChicago. 2004. Archived from the original on February 16, 2006. Retrieved May 29, 2006. ^ "Entertainment | Band settles over sewage dumping". BBC News. April 30, 2005. Retrieved February 19, 2009. ^ a b c "Interview With Bruce Flohr". HitQuarters. October 16, 2005. Retrieved May 12, 2010. ^ "Dream Girl Video". Retrieved December 9, 2006. ^ Dave Matthews (January 29, 2010). "Do You Still Care About John Edwards' Sexcapades?". E! Online. Retrieved July 16, 2011. ^ "Dave Matthews Band Offers DNA To ID Waste – Entertainment News Story – WKMG Orlando". Clickorlando.com. August 30, 2004. Archived from the original on October 6, 2011. Retrieved July 16, 2011. ^ "DMB Fall Tour 2005 stats". DMBAlmanac.com. Retrieved October 7, 2014. ^ "DMB 2006 Summer Tour Song Info". DMBalmanac.com. Retrieved July 9, 2014. ^ "R E V E R B". Archived from the original on June 1, 2008. Retrieved June 15, 2009. ^ "Steven Miller records Dave Matthews Band". Archived from the original on December 9, 2008. Retrieved February 13, 2007. ^ "Nas' New Record Features LeRoi On Sax". davematthewsband.com. Archived from the original on January 21, 2007. Retrieved January 24, 2007. ^ "New Dave Matthews Band Album Set For July Release". Weekly Davespeak. February 3, 2007. Retrieved June 15, 2009. ^ "Jamming with the DMB – Entertainment". BrisbaneTimes. Retrieved June 15, 2009. ^ "Live Earth on MSN: The Concerts For A Climate In Crisis". Liveearth.msn.com. Archived from the original on October 13, 2008. Retrieved February 19, 2009. ^ "DMB 2007 Summer Tour Song Info". DMBalmanac.com. Retrieved July 9, 2014. ^ ""A Dream So Real" Song History". DMBalmanac.com. Retrieved July 9, 2014. ^ Waddell, Ray. > "Shed Tours To Watch." Billboard. May 19, 2007. Page 44. Retrieved December 9, 2016. ^ "A Concert For Virginia Tech". Archived from the original on August 23, 2007. Retrieved August 1, 2007. ^ "The Official Dave Matthews Band Website :: News". davematthewsband.com. August 30, 2007. Archived from the original on December 2, 2008. Retrieved February 19, 2009. ^ "Barack Obama and Joe Biden: The Change We Need | Dave Matthews at Indiana University". My.barackobama.com. April 6, 2008. Retrieved February 19, 2009. ^ "The Official Dave Matthews Band Website :: News". davematthewsband.com. February 11, 2008. Archived from the original on July 8, 2008. Retrieved February 19, 2009. ^ "The Official Dave Matthews Band Website :: News". davematthewsband.com. February 3, 2008. Archived from the original on July 28, 2011. Retrieved February 19, 2009. ^ "After 10 years of Touring, Butch Taylor Calls it Quits". Weekly Davespeak. June 1, 2008. Retrieved August 26, 2010. ^ Brendan Fitzgerald (June 20, 2008). "DMB sax player hospitalized". Portico Publications. Archived from the original on July 8, 2011. Retrieved November 30, 2009. ^ "Front Row King – Dave Matthews Band". Retrieved March 7, 2014. ^ "An Important Announcement From DMB". Archived from the original on July 1, 2008. Retrieved June 30, 2008. ^ "LEROI MOORE 1961-2008". Dave Matthews Band. August 19, 2008. Archived from the original on July 6, 2007. Retrieved August 19, 2008. ^ "Dave Matthews Band saxophonist dies, spokeswoman says". CNN. August 20, 2008. Retrieved August 19, 2008. ^ "road page". stage crew. August 19, 2008. Archived from the original on July 6, 2007. ^ "The Official Dave Matthews Band Website :: News". Archived from the original on July 28, 2011. Retrieved September 12, 2008. ^ "sufac.org". Retrieved June 15, 2009. ^ "Dave Matthews Band Summer Tour Dates". Archived from the original on July 28, 2011. Retrieved February 18, 2009. ^ "Establishment of Moore Fund Will Provide Annual Scholarships for Four Students". US Fed News Service. November 13, 2009. Retrieved November 15, 2009. ^ Apczynski, Dan (December 2009). "King Dave". Retrieved November 15, 2009. ^ "Dave Matthews Band Announces Spring 2009 Tour". Retrieved April 15, 2009. ^ "Chicago Lineup | Dave Matthews Band Caravan". Dmbcaravan.com. Archived from the original on April 2, 2011. Retrieved July 16, 2011. ^ a b "Dave Matthews Band Caravan". Dmbcaravan.com. May 18, 2011. Retrieved July 16, 2011. ^ "DMB 2011 Summer Tour Song Info". DMBalmanac.com. Retrieved July 9, 2014. ^ "DMB: Live in Atlantic City". DMBalmanac.com. Retrieved July 9, 2014. ^ "Dave Matthews Band – Timeline – Facebook". ^ "DMB 2012 Summer Tour Song Info". DMBalmanac.com. Retrieved July 9, 2014. ^ "DMB 2012 Summer Tour Song Info". DMBalmanac. Retrieved July 9, 2014. ^ "Dave Matthews Band Merchandise Store". Davematthewsband.shop.musictoday.com. Archived from the original on July 5, 2012. Retrieved December 17, 2012. ^ "DMB November 30, 2012". DMBalmanac.com. Retrieved July 9, 2014. ^ "DMB Summer Tour 2013". DMBAlmanac.com. Retrieved October 7, 2014. ^ "A Very Special Evening with Dave Matthews Band". Tourdates.davematthewsband.com. Retrieved April 19, 2014. ^ "Big Concerts". Big Concerts. Archived from the original on February 2, 2014. Retrieved April 19, 2014. ^ a b "Upcoming Shows". Dave Matthews Band. Retrieved April 19, 2014. ^ "Dave and Tim: Two Nights at the Saenger Theatre". davematthewsband.com. Retrieved July 9, 2014. ^ "Boyd Tinsley Reveals He Has Arthritius". Jambands.com. Retrieved July 10, 2014. ^ "Boyd Tinsley Reveals He Underwent Surgery for Carpal Tunnel". Relix.com. Retrieved July 9, 2014. ^ "Dave Matthews Band 2 Set Format". davematthewsband.com. Retrieved July 9, 2014. ^ "DMB 2014 Summer Tour Song Info". DMBalmanac.com. Retrieved July 9, 2014. ^ "Dave Matthews & Tim Reynolds To Play Two Shows In Oakland". JamBase.com. Retrieved October 7, 2014. ^ "Dave Matthews Band Vive Latino". davematthewsband.com. Retrieved November 30, 2014. ^ "Summer Tour Dates Announced". davematthewsband.com. Retrieved January 13, 2015. ^ "Dave Matthews Band-- International Fall Tour 2015". davematthewsband.com. Retrieved February 28, 2015. ^ "Dave Matthews Band-- Summer Tour 2018". ^ "Come Tomorrow release date". ^ "Boyd Tinsley fired from Dave Matthews Band". ^ "Buddy Strong Brand on Instagram: "🚨🚨O F F I C I A L•A L E R T🚨🚨 Proud to announce that I'm working with @davematthewsband #DaveMatthewsBand for the upcoming Summer tour....."". Instagram. Retrieved May 18, 2018. ^ "DMBAlmanac.com²". Dmbalmanac.com. Retrieved May 18, 2018. ^ Revkin, Andrew C. (May 31, 1998). "POP/JAZZ; A Band That Built a Career From the Ground Up". The New York Times. ISSN 0362-4331. Retrieved January 24, 2018. ^ "Dave Matthews Band MSG Source List". Etree.org. Retrieved July 29, 2009. ^ a b "Dave Matthews Band/BAMA Works". Official Dave Matthews Website. Bama Rags Inc. 2010. Retrieved May 14, 2010. ^ Wickersty, Todd (2010). "Inside the Warehouse: The Dave Matthews Band fan association". tumblr.com. The Butter Room. Retrieved May 14, 2010. ^ "DMB MySpace Website". Video receiving award. Dave Matthews Band. 2004. Retrieved March 12, 2009. ^ "Dave Matthews Band – Why Oh Why/Crush". Video of NAACP Award. YouTube. 2004. Retrieved March 12, 2009. ^ "Dave Matthews Band's Charity Work, Events and Causes". Looktothestars.org. Retrieved December 17, 2012. ^ Bojalad, Alec (July 28, 2011). "Dave Matthews to Play Acoustic Set for Charity of Ticket-Buyers' Choosing". Billboard.biz. Retrieved December 17, 2012. ^ "Dave Matthews to Release 1996 Solo Show". Jambands.com. Retrieved June 8, 2016. Wikimedia Commons has media related to Dave Matthews Band.